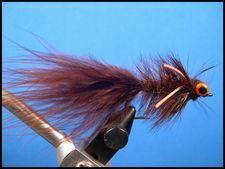 This is my version of Tim Holschlag's Hackle Fly which he uses for smallmouth bass. Tim is the Warmwater Columnist for Midwest FlyFishing Magazine and a guide in the the Upper Midwest. 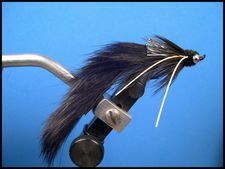 The Black Dredger is my warmwater version of Kelly Gallop's popular western streamer -- The "Spark Bug." 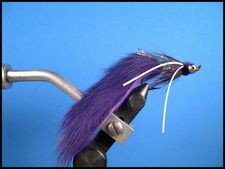 The Purple Dredger is one of three flies in the Dredger Series. The other's are the Black Dredger and the Chartruese Dredger. The Chartreuse Dredger is one of three flies in the Dredger series along with the Black Dredger and the Purple Dredger. Don't discount this little fly with the lead head. It's deadly on almost every warmwater gamefish there is. 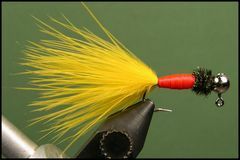 This is my variation of a Rich Osthoff Soft-Hackle Woolly Bugger that he uses to take Smallmouth Bass and big Brown Trout. The Fly Rod Jig in it's various incarnations is a deadly fly, especially for Crappie. Tie it on any size Jig you want in any color or combination of colors that suit you and the fish. Fish it "straight-up" or under a large strike indicator and you are virtually guaranteed fish. 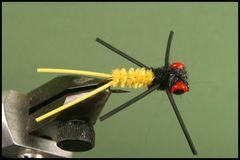 This is one of six Bream Bugs created by Carter Nelson for taking big bluegills in deep water. 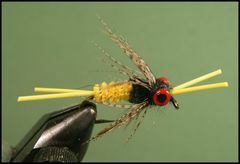 The flies first appeared in the now defunct Warmwater Fly Fishing Magazine. 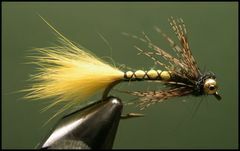 This is the second fly in a series of six flies created by Carter Nelson to take big Bream in the heat of summer. 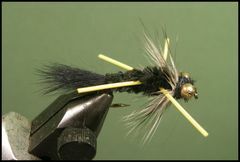 This is the third fly in a series of six flies that Carter Nelson has created for taking large Bream in the heat of the summer. 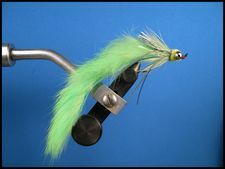 This is the fourth in a series of six flies that Carter Nelson has developed for taking big Bream in the heat of the summer. 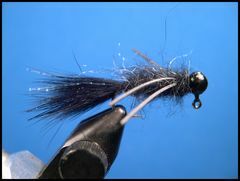 This is the fifth in a series of six flies that Carter Nelson uses on big Bream in the Summer's heat. 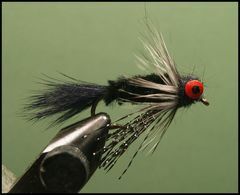 This is the sixth and final fly in Carter Nelson's Callaway Lakes Series of Bream Flies. The Purpetrator is a fly rod version of the famous plastic worms that baitcastors have used so successfully for bass over the years. At one time the tube jig was a favorite on the bass tournement trail and it still remains so for many bass fishermen today. This is a fly rodder's version of that versitile lure.